But the food tasting and experience i had exactly 6 days ago (so accurate lol!) felt like i was transport to Mie for the night and back again when i had to go home /sobs. The food was so fresh and good it felt almost like i was in Mie itself having their immediate freshly caught seafood prepared on the spot for me (maybe that's how it's actually done in Sasagawa restaurant!). Like the saying goes that good food is always meant to be share and knowing i rarely write about food unless it's really good so go easy on me ok guys? lol. Learned a new pose from the Ninja who came all the way from Mie! When i said i went to Mie and came back, it wasn't literal lol, in fact you can actually visit and have a taste of Mie's finest delicacies itself without having to leave the country! I mean, if you prefer to fly there to eat then by all means, but make sure to schedule your Mie trip in May 2016 as something big is going on that period. But some of us might not have the luxury of (time & financials) to travel as often as they like, so instead another alternative option if your tastebuds are really in for a treat then i would direct you to SASAGAWA, Authentic Japanese Cuisine in Sheraton Imperial Hotel, KL where you can feast on authentic Japanese food. Seriously i can't help but feeling so blessed and thankful for the dinner, catching up with friends and of course meeting the master chef creator behind all these delicious food i had that night, Executive Chef, Hitoshi Sasagawa. How many of you know of Mie Prefecture? Honestly i have seen it on the map during my recent Japan trip but know not much of the place because there are hardly any mentions about it compared to the usual big city tourists spots. And did you know that Mie prefecture is the original BIRTHPLACE of Ninjas , otherwise known as Ninjutsu and produces the finest agriculture and fishery products. Located within Kansai region on the main Hoshu island surrounded with natural waters and mountains, from just typing this out it really makes me want to visit the place liao haha! You can virtually visit Mie prefecture here (click me). So enough talking, let me introduce the dishes and some of my personal thoughts about them aside from just saying "I love every single one of them" (actually i do haha). Each fresh ingredients used are specifically prepared to retain it's natural flavors and enhanced with minimal seasonings like the usual way of Japanese food preparation, learned that from Cheesie! To ensure the freshness of the ingredients used, Sasagawa-san imports them 4 times a week directly from Japan to Malaysia. Gawd..this is the first time i've eaten such silken fine tofu that it feels like i'm actually eating silk instead of tofu! The smooth creamy texture upon coming in contact with your tongue (almost felt like it melted instead) is a hard to forget experience but not everyone like soft tofu (like me) but for this case i would make that an exception because the smooth tofu tastes so good paired with the tangy yuzu sauce and salted anchovies. Despite it being called a bitter tofu, surprising i didn't taste any bitterness at all, maybe a hint but easily covered by the yuzu sauce. Call me a picky eater, seriously! Because i also don't like anything fried or squishy like eggplant dishes (like our Malaysian one, eww) but after having the Fried greenling fish and autumn eggplant makes me take back those "yucky" thoughts lol. Especially that eggplant dish! It's not your average squish funny tasting eggplant like all kids dislike, this is juicy with a slight leather like texture making the chewing process pleasant. 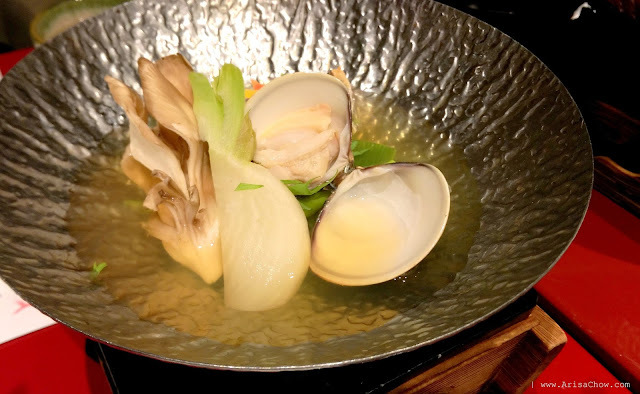 I enjoyed this dish the most, out of the whole course this has got to be my favorite is because of the hot clear based soup sweetened by the clams and complimented with perfectly seasoned Nodoguro (rosy sea-bass/ blackthroat) all cooked on the spot in front of you. The fish texture was just perfect- soft and hot flesh bursting with flavor, felt like i could eat the whole fish if they had any served lol. Now this dish is seasonal, so not all the sashimis i had that night are available on a regular basis but rest assured they are replaced with other types of equally delightful sashimis. The vibrant color coordination is a real feast to the eyes! This rice dish is cooked in small batches (small pots to be exact) to ensure the taste is fragrant, rich and consistent. The Fukusa Miso soup it topped with bits of fired tofu. Obviously no meal is complete for a Japanese without the usual rice lol. Simmered lower half of an Ise Ebi (lobster) steamed with egg, Ginkyo, Japanese Red Kintoki Carrot and Green Beans. Can't help but to stare at the beautifully orange tail of this Ise ebi lol. This grilled platter consists of Ise-Ebi (lobster), Mie's Scorpion Fish and accompanied side dishes of Japanese pickles, Kinzanji Miso and Japanese Citrus Sudachi. This is my first time seeing and being served a cooked lobster upclose, was very intrigue by their skin texture lol and no hassle to dig the meat out of the shell as it's done and served opened for you. Not a dish you would feel guilty upon eating because there is very minimal oil used during the grill and it doesn't reek of any oil taste leaving you to enjoy the grilled taste of fresh seafood meat that crunchy on the outside and soft on the inside. Since it's almost mid autumn already seasonal fruits like Persimmons, Nashi (pear) and Melon- the prototypical luxury fruit of Japan. From left: Leong Shen, Robin, Audrey, Cheesie (congrats on your latest pregnancy!) & me. Had so much fun and tummy filled with so much delicious food that night that i think i ate my quota for the whole week lol. Thank you so much once again Mie Prefecture, i'll promise to visit you soon (hopefully) and SASAGAWA Authentic Japanese Restaurant for having me over! Remember i mentioned earlier in this post about something big happening in Mie next year May 2016? You can book your flights via airasia, as they usually have the best rates around. To enjoy all these delicious food pictures i've just posted and wrote about, head over to SASAGAWA Authentic Japanese Restaurant, KL today for only RM300. This menu is only valid till 31st December 2015. Make sure to call and make a booking to avoid disappointments.